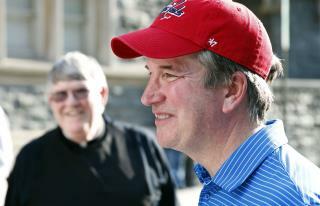 (Newser) – Supreme Court nominee Brett Kavanaugh appears to have had something of a soft spot for the Washington Nationals, to put it mildly: He went tens of thousands of dollars in debt buying baseball tickets over the last decade, according to the White House. Kavanaugh, who reported having between $60,000 and $200,000 debt in 2016 on a financial disclosure form, spent the money on season tickets and playoff tickets for himself and friends, White House spokesman Raj Shah tells the Washington Post. Shah says the friends reimbursed Kavanaugh—who earns around $220,000 a year as a federal judge, plus teaching income—and he has now stopped buying baseball tickets. Shah says the debt was paid off early last year and Kavanaugh and his wife now have no debt apart from a mortgage on their home. "Kavanaugh Disclosure Reveals Big Baseball-Related Debt" Actually what it REVEALS to me is: 1) He is obviously a very kind and big hearted trusting person to put out that much money for his friends and relatives. 2) That his friends and relatives are very lucky to have such a friend. 3) He is a good judge of people if they all repaid his advances of money. No doubt, and rightly so, it will be raised at his hearing.